When news broke yesterday of Andy Dalton’s brand-new six-year $115M deal Bengals Nation should have rejoiced. Instead many Bengals fans were most likely like myself left scratching their heads and asking one simple question, why? 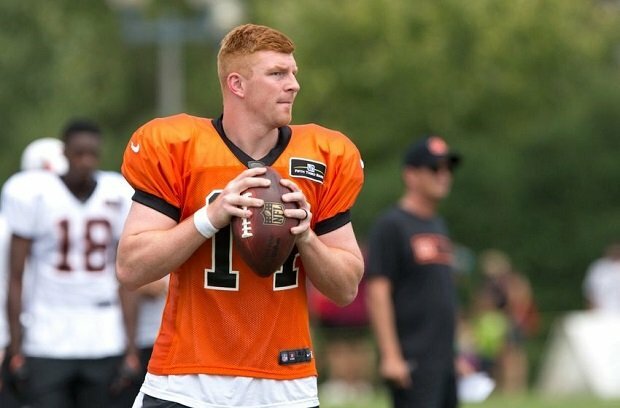 When Andy Dalton was drafted as Cincinnati’s number one pick in the second round of the 2011 NFL draft Bengals fans were certain that they had their franchise quarterback for the foreseeable future and yesterday’s big contract extension says that management still believes that to be the case; which to me honestly makes no sense at all! Although Dalton has led the Bengals to a playoff appearance in each of the last three seasons he’s lost all three games. The team won’t make money without fans in the stands and I can assure you that Bengals fans only care about one thing just as fans of any sports franchise do; winning! This isn’t the Oscars and there’s no political correctness in sports where fans are willing to say that making the playoffs is their version of oh it was just an honor to be nominated, the playoff appearances mean absolutely nothing without a championship ring to back them up! It seemed as though Bengals management came to the same conclusion when they drafted former Alabama Crimson Tide quarterback AJ Mccarron in the fifth round of the 2014 NFL draft. It’s one of the oldest adages in sports, if an athlete is underperforming you bring in another athlete in their position to push them and Mccarron seemed to be the perfect choice to do just that. His presence on the team should have shown that Dalton had the ability to rise under pressure or it would have eventually shown that he would have folded under the pressure and the job of starting quarterback for the Cincinnati Bengals would’ve went to Mccarron. So why then did the Bengals sign Dalton to such a lengthy and hefty contract extension? The simple answer is; they hit the metaphorical panic button. The NFL product has become so offense oriented over these past several years that if a team doesn’t have a quarterback they panic and feel they have no chance at all to succeed long-term. As such instead of doing the smart thing and offering Dalton something like $25-$30M over three years and subsequently seeing how both he and Mccarron would work out; they gave Dalton the huge payday rather than risk allowing him to walk. What’s done is done and the Bengals will have to try to live in the bed they have made. However I can promise you that Bengals fans won’t care about the franchise losing face with all the money they have given Dalton if he continues to fold under the pressure of the big game. They will insist that Mccarron gets the chance to start and they should; why? Simple, Mccarron did something in college that Dalton couldn’t; win a National Championship. Granted The Rose Bowl is a somewhat big game too but a National Championship it is not. NFL football more than ever as I’ve already said is the quarterback’s game and if your quarterback doesn’t help you win, you’ll be forced to make a change. No matter how the situation in Cincinnati plays itself out one thing remains certain. As long as team ownership in every sport is willing to pay their star athletes such outrages salary, situations like this one are going to occur. The sad but true tale is that the teams themselves can’t be blamed because they are just doing what they have to do to survive within a flawed system. Nothing would make me happier than to see Dalton lead the Bengals to multiple Super Bowl championships. However even if he does as the old saying goes the buck won’t stop with him. The system will still remain flawed until the NFL gets a commissioner that forces team owners to fix it.